At the starting line in the Jura mountains on a very hot summer day! Photo courtesy of Trail du Saugeais. Francesco: Marie and I decided to run the 22-km course (+650 m) of the Trail du Saugeais, leaving the 33-km (+1,300) to the experts. The region of Saugeais, a small self-proclaimed république, is close to the Swiss border and the Doubs River. This area has maintained its authenticity and takes great pride in its production of organic Comté cheese, which it has been doing for more than 40 years. It’s true that the Trail du Saugeais is not in the Alps, but it’s a good place to admire the big sister of the Alps, the Jura Mountains. And, on a clear day, you have views of Mont-Blanc and the Bernese Alps, so there are lots of great reasons to run the Jura! 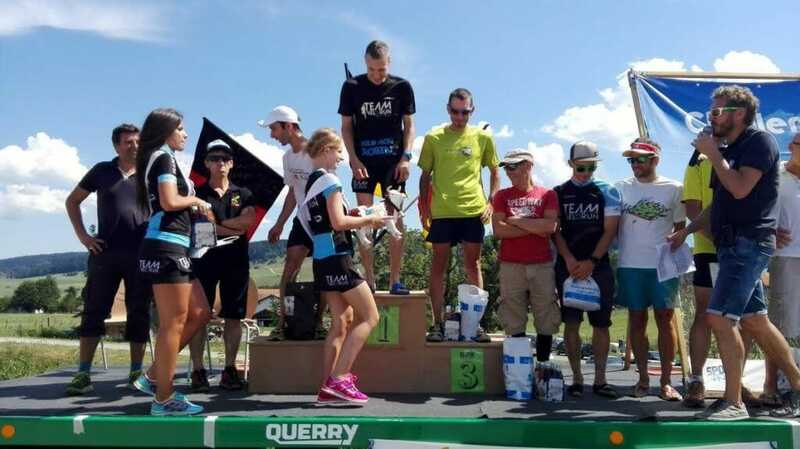 This area of France has a deep love for trail running, as demonstrated by the Doubs Terre de Trail series, which includes about 20 events per year in the Franche-Comté region. The most famous of these racing events takes place in the urban center of Besançon. The Trail des Forts travels around the city’s impressive Fortifications of Vauban, a UNESCO World Heritage Site. The Trail du Saugeais is also part of the Doubs Terre de Trail series. This newcomer event offers an ambitious line-up of races and has Patrick Bohard — the 2015 winner of the extremely difficult 330-km (+24,000 m) Tor des Géants — as a mentor. The playful design of the Trail du Saugeais poster is in keeping with the fun approach of race organizers. Image courtesy of Trail du Saugeais. Francesco: During the race, the best spot for us was reaching the belvedere at Le Crêt Monniot: the panoramic view goes 360 degrees around the Alps and to eastern France and the Vosges mountains. With various parts of the course located in wild forests, plus the addition of steep ascents followed by downhill running, you are rarely, if ever, on flat terrain during the race. Your legs and your feet never get a break. Instead — and thanks to the sound of the ever-present cow bells — you always find yourself doing the boogie-woogie to the rhythm of the bells. Overall, this race was well organized and timed perfectly. We easily found a place to park our car, along with the 600 other participants! Also, the food — traditional Morteau sausage, various local cheeses and more — served after the races was great, and all with a festive and convivial atmosphere. I had no congratulatory kisses from Miss Franche-Comté this year, but I will train for the 2017 Trail du Saugeais, and will surely take part in this event again. Miss Franche-Comté 2015, Alizee Vannier, and Pauline Chicaudet, the winner of the Prix de l’Elégance for Miss Doubs 2016 presenting awards at the Trail du Saugeais. Photo courtesy of Trail du Saugeais.